Deciding what tools are needed for your drop ceiling project. Have you ever tried to work on a project and not have the right tools to complete the job? Well if you don’t have the right tools to install a suspended ceiling…plan on wasting a lot of time. While many homeowners can easily install a drop ceiling, having the right tools makes it all that much easier, especially if you haven’t done it before. Here is a list of tools and hardware that we compiled so that you can install you suspended ceiling the right way the first time. Step 1 – Drop ceiling installation tools check-list. (1) Laser or standard level for leveling ceiling grid and installing wall angle. 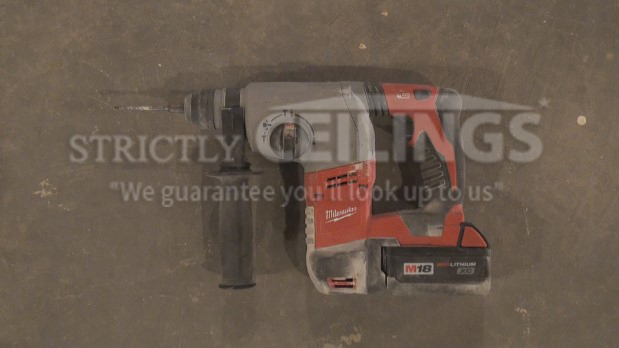 (2) Cordless Drill for installing wall angle, drilling Holes, or installing wood lags. (3) Hammer for installing nails or staples in the wall angle. (4) Wood Lag Adapter for wood lag installation into joists to hang ceiling wire from. (5) 1/8” Drill Bits for drilling holes in grid or drilling out rivets in case of mistakes. (6) 25’ Tape measure with a 1” blade for ceiling grid installation, ceiling tile installation and layout. (7) Pencil for figuring layouts and marking string and cross tee locations. (8) Tin snips for cutting wall angle and ceiling grid. (9) Punch Pliers for punching 1/8” holes into ceiling grid for riveting together. (10) Pop Riveter for securing ceiling grid to the wall angle. (11) Spring Clamps – 4 or 5 for temporarily holding cross tees and main runners to wall angle. (12) String Line for ceiling grid installation or leveling grid on short runs. (13) 8” Linesman Pliers for cutting and pulling down wire as well as crimping wall angle. (14) Speed Square for squaring cut wall tees when installing ceiling grid. Step 2 – Optional drop ceiling installation tools. (1) Cordless staple gun for quickly installing wall angle onto drywall, plaster or wood paneled walls. (2) Trak-it Gun for quickly installing wall angle into concrete block or poured walls. (3) Hammer drill for installing anchors or wall angle into concrete. 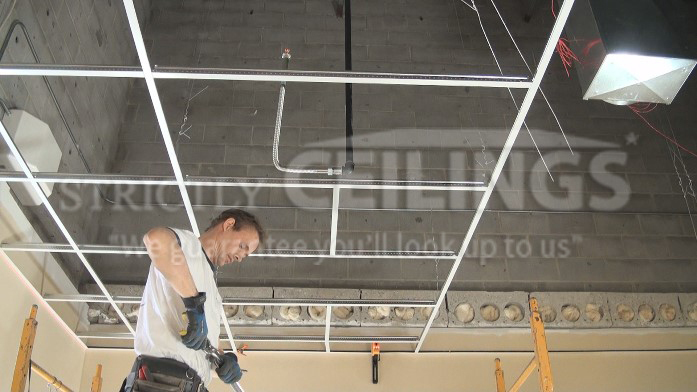 Step 3 – Drop ceiling tools for installing ceiling tiles. (1) Utility Knife for cutting ceiling tiles and opening boxes of ceiling grid. (2) Sharpening Stone for sharpening the blade on the utility knife when cutting ceiling tiles. (3) Jab Saw for cutting holes in ceiling tiles for can-lights and HVAC ducting. (4) Circle Cutter for marking holes on ceiling tiles for can-lights and pipes. (5) White Squeezable Caulk for repairing nicks in ceiling tiles. Step 4 – Hardware for installing drop ceilings. (1) Pop Rivets for securing ceiling grid cross tees and main runners to the wall angle. (2) Lag Screws for installing into wood joist and hanging ceiling wire. (3) 18-gauge Ceiling Wire for hanging drop ceiling grid. Use straight wire not spooled. 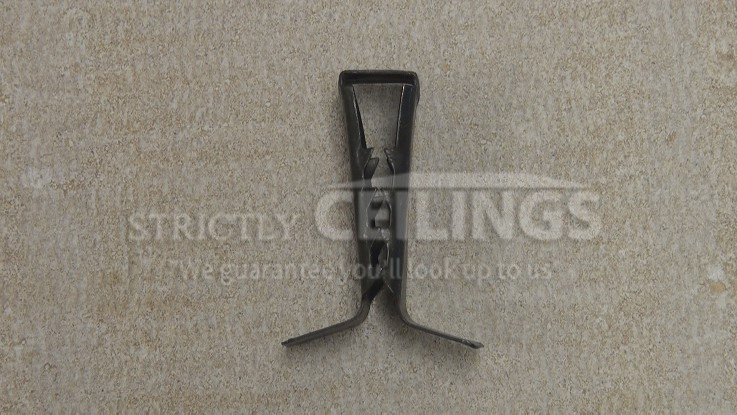 (4) Hold-down Clips for securing ceiling tiles in vertical ceiling drops. Also great for vestibules with high air flow and suction.